Multibagger Stocks – The year 2015 was a bad year for the Indian stock market. A majority of blue-chip stocks turns out to be a big loser in 2015. 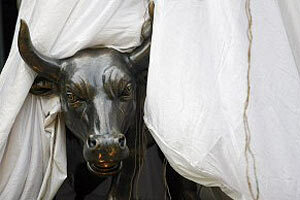 However, few multibagger stocks were able to give magnificent returns to the investor. Here are 5 Multibagger stocks that doubles or triples investor money in just 6 months. These stocks are likely to give good returns in 2016 also. SpiceJet is first multibagger stock. SpiceJet is Indian low-cost airline company. In recent past, SpiceJet was once again acquired by old promoter Mr.Ajay Singh. After this acquisition SpiceJet stock has increased by Jet Speed giving 330% return in past 6 months. The stock was trading at 20 Rs value in July 2015 and today stock is trading at 82 Rs. This means SpiceJet was able to increase investor money by 4 times in just 6 months. Gayatri Projects is next in the list of multibagger list. Gayatri Projects is civil construction infra company. Gayatri Projects were able to generate 130% returns in past 6 months. Gayatri Projects is sitting on healthy order book worth 10,000 Cr. Fundamental of stock seems to be very good. The stock is expected to get an additional benefit of the upcoming smart city project. 8 K Miles is a leader in providing secure, cloud, Identity and Big Data Solutions. 8 K Miles stock is trading on lifetime high. 8 K Miles were able to nearly triple the investor money in 6 months. A fundamentally stock is in a better position and expected to give good return in future. Kwality is food processing dairy sector company. This stock was able to generate 125% return in just 6 months. If you have invested 20,000 Rs in Kwality stock before 6 months. You would have got 43000 Rs by selling these stocks. Kwality current market price is 137 Rs and it is expected to reach 180 Rs soon. Tata Elxsi is fifth in the list of multibagger stock. Tata Elxsi is tata group company dealing in technology and engineering. Tata Elxsi was able to give 82% return in just 6 months. In one year time spends this stock was able to deliver more than 3 times return. If you have invested 20,000 Rs in Tata Elxsi stock before one year you would have got 65,000 Rs today. Current Market price of Tata Elxsi is 2212 Rs and expected to touch 2500 Rs in near future. Do you know any other Multibagger stock for Investment? 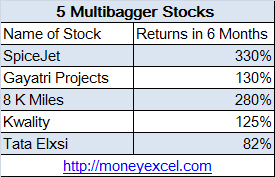 What is your take on these Multibagger Stocks? Do you think it is worth to invest in these stocks for 2016? I have seen you providing information regarding stocks on historical basis. I would recomend you to provide the information regarding stock as on today so that we can check the performance post your recommendation.